Moist Coconut Pound Loaf Cake. Light, soft, and oh so delicious! Moist Coconut Pound Loaf Cake. 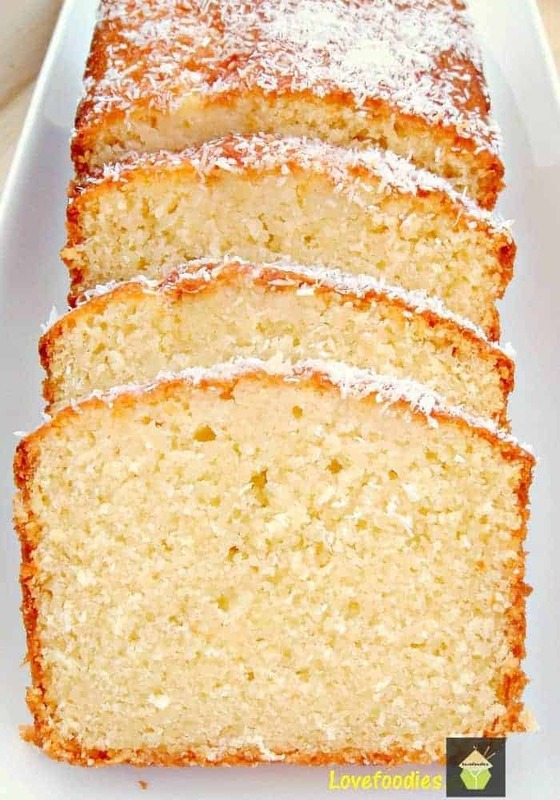 This is such a delicious and popular coconut pound cake recipe. Once you’ve tried this recipe, I am sure you will make it time and time again. The recipe itself is very easy to follow, just prepare all your ingredients and add step by step. For the baking time, please do check after 50 minutes as everyone’s ovens can vary so much. 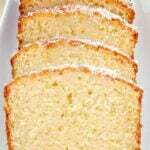 The texture of this coconut pound loaf cake is a fine crumb and very moist. The flavor is simply wonderful, packed with coconut, it’s a perfect cake to go with a cup of tea! This coconut pound cake is very freezer friendly so if you wanted to make a few loaves or perhaps cut into portions and freeze, there isn’t any loss of quality once defrosted. We’ve got a lot of pound cake recipes, with all different flavors and textures so make sure you check them out. There’s a cake to suit everyone! So here’s the recipe for my Moist Coconut Pound Loaf Cake, and please enjoy! You will need a loaf tin, mine measures 30cm x 12 cm, and 8cm deep. (12 inch pan) .The batter will also fit in a 9 inch loaf pan. Please note cook times will vary if you are not using a regular loaf pan. 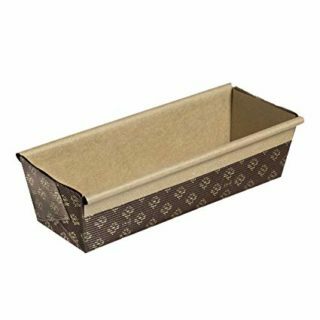 If you’re thinking of making our Coconut Pound Cake to give to a friend, why not bake it in one of these disposable baking pans. They’re terrific and so pretty too! 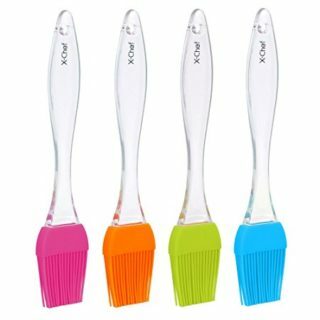 You can choose different colors and we think they would make your pound cake look lovely! Festive too! 4 – 6 Tablespoons desiccated/shredded coconut, depending on how you like it! **** Please note: Taste the coconut milk first, if you want it sweeter, add approx 2 Tablespoons powdered sugar to it and mix until dissolved. The cake does already contain a lot of sugar but some of you have a very sweet tooth! 1. Heat oven to 160C, Gas 3, 300F. Grease and line your baking tin. See here for how to line. 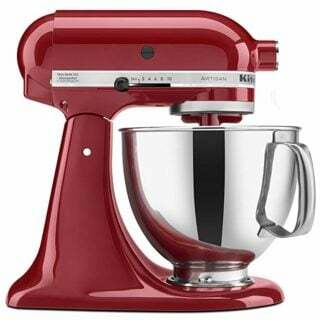 This Kitchenaid mixer is what I use for all my cakes and much more such as kneading dough for bread! If you haven’t got one, we can recommend this. I have a red one and a silver one! 4. Slowly add the beaten eggs to the mixer, on a low-speed setting, a bit at a time. 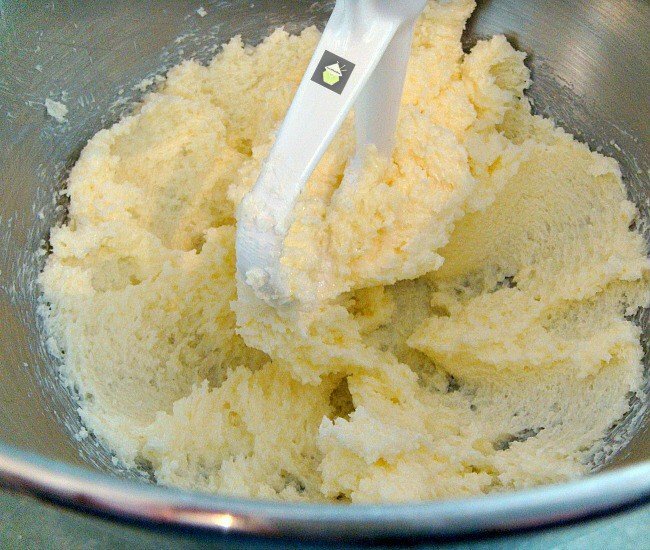 If the mixture starts to curdle or split, add a spoonful of your sieved flour, keep on adding the eggs, and a bit of flour if necessary until all the eggs are added. 5. Add half the coconut milk with half of the flour, keeping the mixer on a slow speed. Once combined, add the shredded/desiccated coconut, and the rest of the coconut milk and flour. 6. 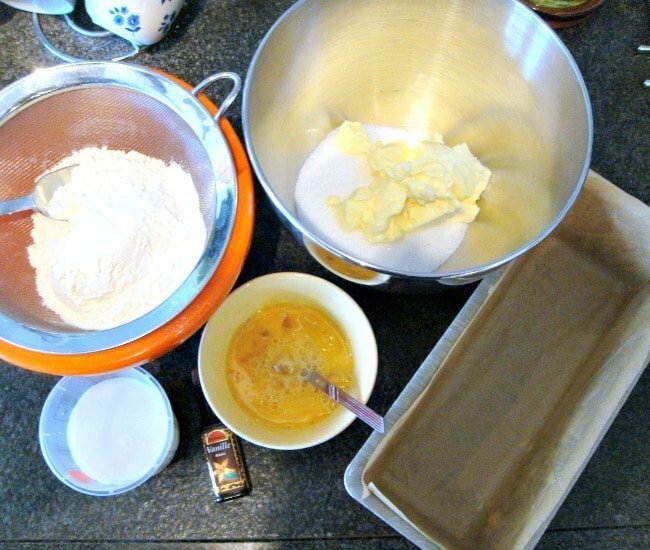 Transfer the cake mixture to the greased and lined loaf tin. Then place in the oven for 1hr and 15 minutes. ***** Please note, if using a Bundt tin, cook time is 1 Hour 5 minutes. *** Please do a test if the cake is done by using a skewer and poke it in the middle to see that it comes out clean. Every oven is different and cook times may vary a little. 7. Have a cup of tea whilst your coconut pound cake is baking and giving off those lovely aromas in your kitchen! 8. When the cake is done, take it out of the oven and leave in the cake tin until cool. Whilst the cake is still HOT, using a skewer, prick holes all over the top of the cake, pushing the skewer through to the bottom of the cake. Gently pour the coconut milk all over the surface of the cake, distributing evenly with a brush if needed. The liquid will be quickly absorbed by the cake. Then immediately sprinkle the dried coconut all over so it sticks. You can use as much dried coconut as you wish. I only added a light sprinkling, but the choice is yours! Allow to cool. 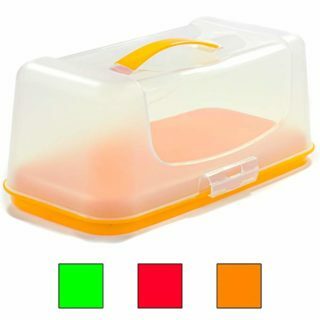 Store in an airtight container. This cake is best eaten the following day, although it doesn’t usually last that long! 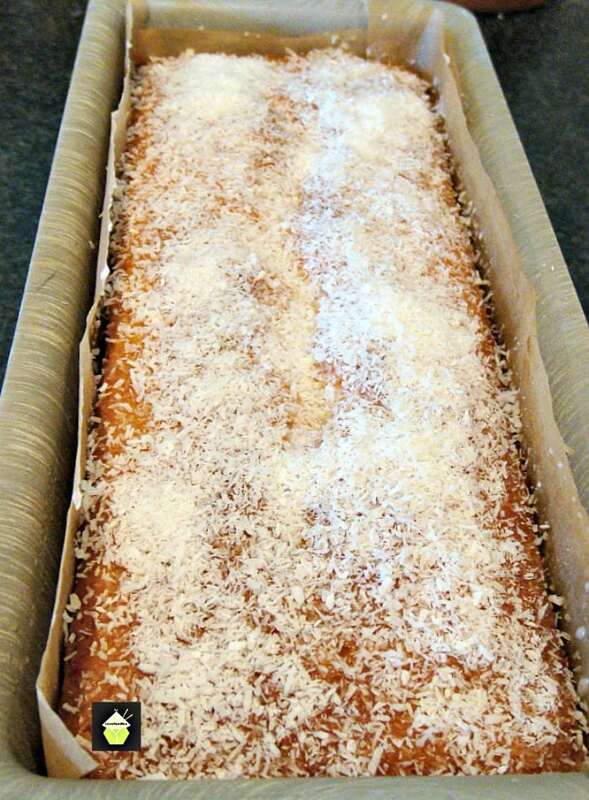 And there you have our lovely Moist Coconut Pound Loaf Cake. If you make cakes as much as we do, it’s worth investing in one of these loaf cake savers. We have the red one! It stops the cake from drying out and looks good enough to go on your countertop too! I also use it when I transport my cakes to parties or when I visit friends. Keeps it in one piece! 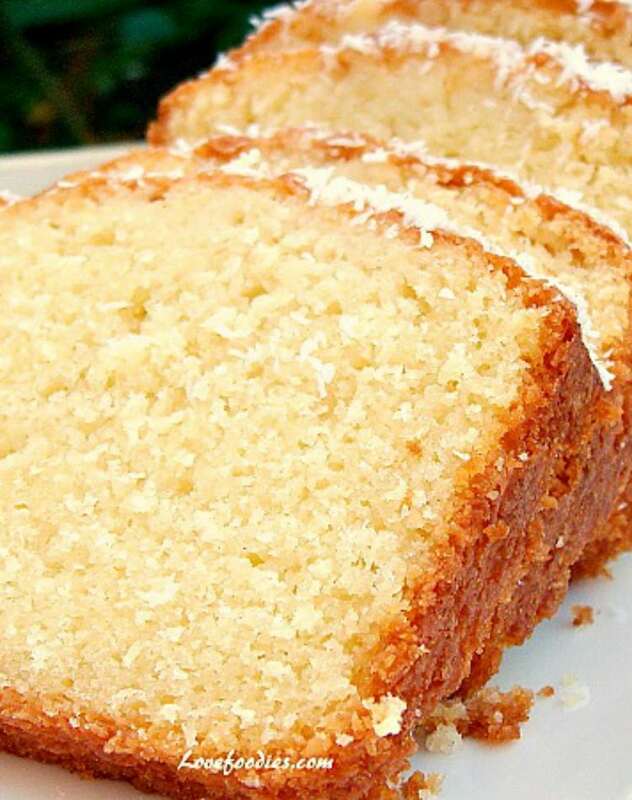 We’d love to hear from you and what you thought of our moist coconut pound loaf cake recipe. Did you make any changes or add some other goodies? Let us know in the comments below. Thanks for reading and happy cooking! Here’s one I made for Christmas to take to a friend! 4 - 6 Tablespoons desiccated / shredded coconut, depending on how you like it! Tablespoons **** Please note: Taste the coconut milk first, if you want it sweeter, add approx 2 powdered sugar to it and mix until dissolved. The cake does already contain a lot of sugar but some of you have a very sweet tooth! Heat oven to 160 C, Gas 3, 300 F. Grease and line your baking tin. Transfer the cake mixture to the greased and lined loaf tin. Then place in the oven for 1hr and 15 minutes. ***** Please note, if using a Bundt tin, cook time is 1 Hour 5 minutes. When the cake is done, take it out of the oven and leave in the cake tin until cool. Whilst the cake is still HOT, using a skewer, prick holes all over the top of the cake, pushing the skewer through to the bottom of the cake. Gently pour the coconut milk all over the surface of the cake, distributing evenly with a brush if needed. The liquid will be quickly absorbed by the cake. Then immediately sprinkle the dried coconut all over so it sticks. You can use as much dried coconut as you wish. I only added a light sprinkling, but the choice is yours! I have baked it twice, cake comes out perfect except the color. Color remains white. I brown it at 230c after cake toothpick comes out clean. Hi, the temperature is supposed to be set at 300 degrees F. If it’s not baking in the middle increase the temperature. Altitude matters as well. This pound cake is so awesome. You should definitely try baking it again. It’s worth it. Hi I made this cake tonight but messed it up because I don’t think I cooked it at a high enough temperarure, I don’t have a fan oven just a regular one but I have a good quality loaf tin which is made of anodized aluminium and I’m supposed to bake items at 10-15 degrees lower than what is stated in recipes so I had the temperature at 150 degrees for 1 hour and 10 minutes and it was still completely raw in the middle (the cooked part tasted totally delicious) is the temperature of 160 degrees that is stated in the recipe for a standard oven or fan oven? 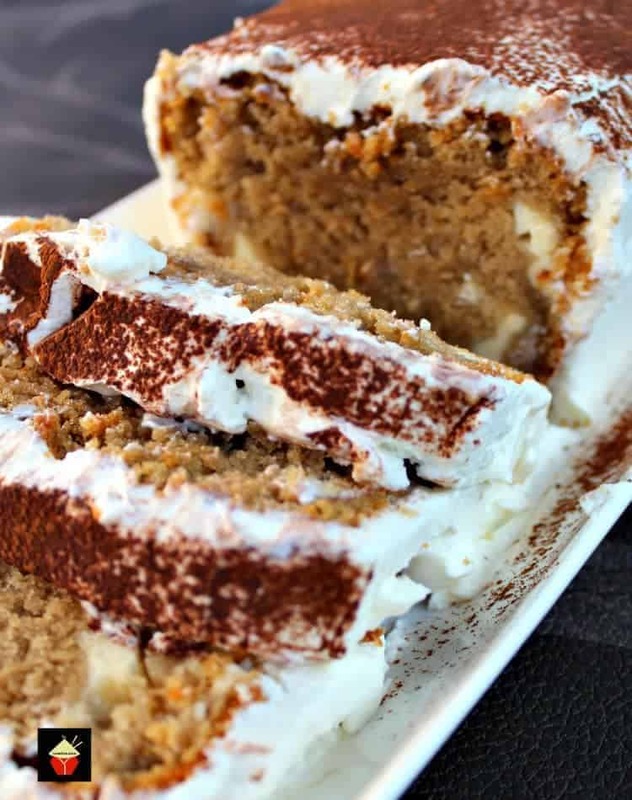 Can you please tell me the recipe of an eggless version of this cake? I have tried this with egg and it is just awesome. Please help me with the eggless version. I’ve tried your coconut pound loaf recipe a few days ago. It turned out great, my parents complimented the cake very well. I baked it at 180°C for 50 minutes. Thank you so much for putting trust back in me that internet recipes aren’t useless anymore. I’ll be making this cake again soon. One of the best cakes I made today. However, baking time was bit different. It passed toothpick taste when it was fully white. Then I just browned it at 220 c for a couple of minutes and end result was a perfect cake atleast for my family is guess. I thank you from the bottom of my heart for such a great recipe that made my day. Made this for the first time today, followed the recipe to the dot and it came out amazing! Just what I wanted, lovely and moist, baked perfectly with timings, went down a treat and will definitely make again! Are all your Centigrade temperatures for a fan oven, re comment below? If not specified I would have assumed that I needed to reduce the temperature too. I find it frustrating when people don’t specify in recipes as that can be the difference between success and failure. Your recipes look great but please clarify this point. Maybe this is why some people have not been successful. Hi I’d like to make this cake but don’t have coconut milk. Can I use regular milk instead? Hi, yes, you can use the same amount in regular milk. Obviously be aware the coconut flavor won’t be as strong! No need to add anything else. Thank you for a wonderful recipe. I shall try some of the others. As you say, it didn’t last very long… didn’t make it to the end of the day. Ive made this coconit cake twice and it was absolutely amazing. Everyone loved it and yes it doesn’t last past a day its that scrumptious . Hi Deirdre, so glad you’re enjoying our pound cake recipes! Unfortunately, I don’t have a cook book but it is on my list to do!! 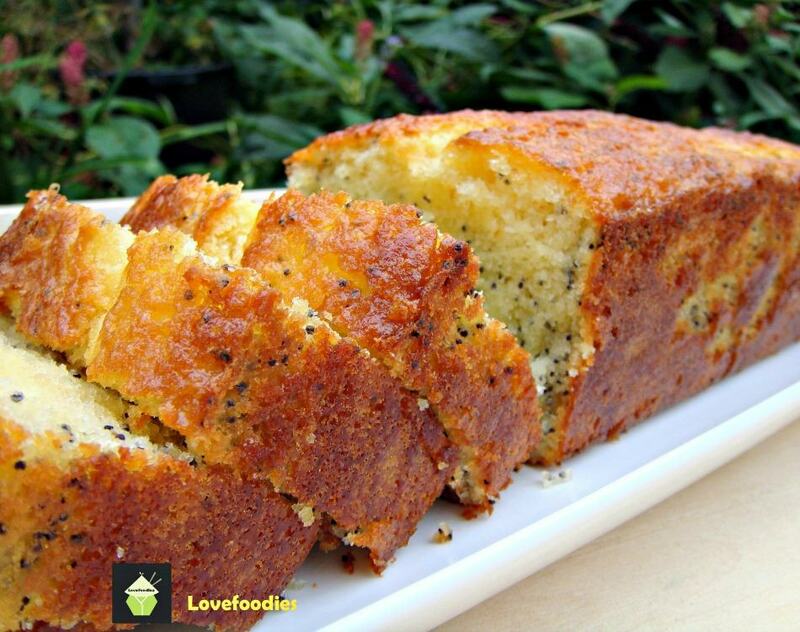 But for now, if you search Lovefoodies pound load cake recipes you will get them all! We do have a lot and they’re all very popular so choose which ones take your fancy! Please enjoy and thanks for writing in! Can you make cupcakes out of this recipe, I made the loaf twice now but didnt get to taste it myself 🙁 but, everyone said it was out of this world :). Hi Sunny, yes, I’ve made cupcakes using this recipe and it works fine. The cook time will be less of course! Hi, just wanted to say thank you for the recipient. My partner made it and it was sublime. I buy. Slice of coconut loaf at my favorite coffee shop that costs more than this recipe and this one is far superior. I am making it again this morning and might try raw sugar instead of white, just to see how it goes. Hi Madonna, I’m so happy you enjoyed the recipe! I’ve also used raw sugar to bake this cake before and I didn’t notice any change in flavour. The only difference I noticed was the colour was not as white once baked so if that doesn’t matter to you then it will be fine! 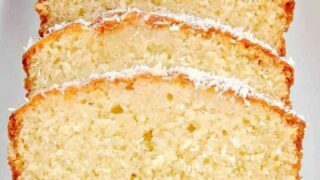 This Moist Coconut Pound Loaf Cake is delicious. The name is a bit misleading. 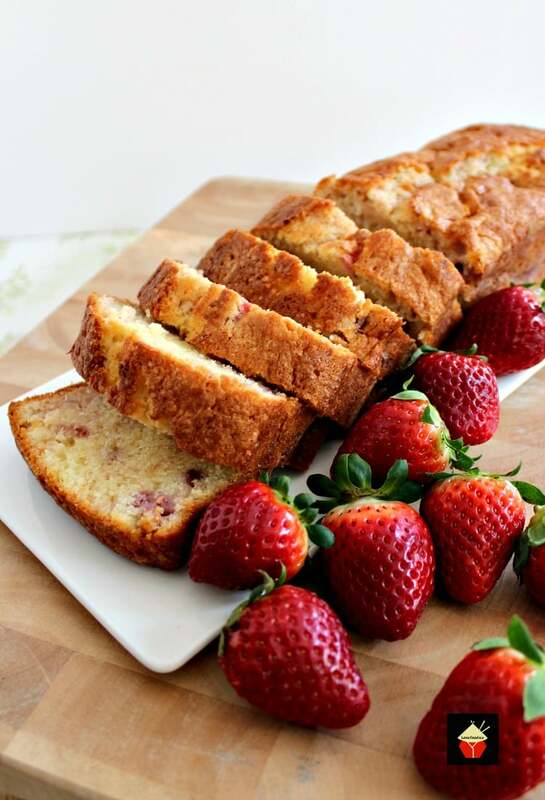 It’s not a traditional pound cake, but more of a cross between a quick bread and a pound cake. 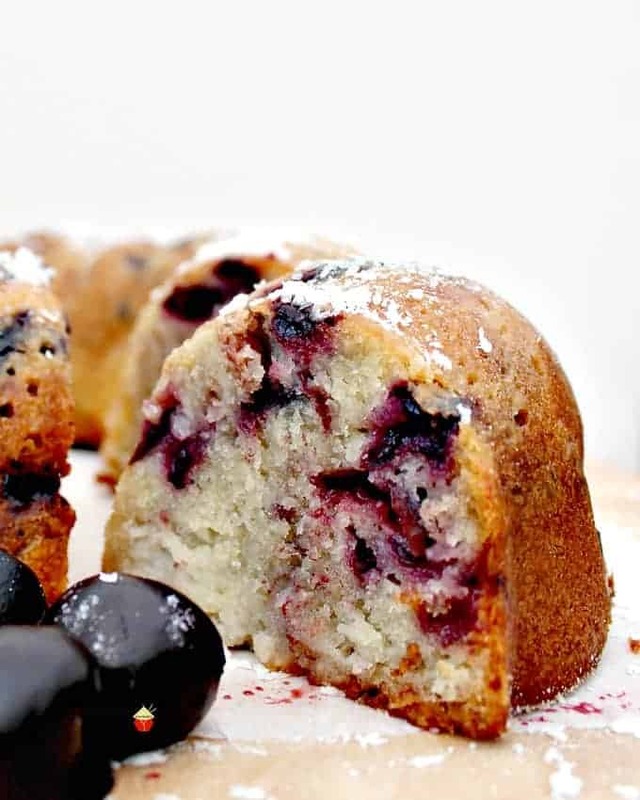 Pound cakes usually rely on beaten eggs rather than baking powder as a leavener. The crumb is tender, moist, and slightly coarse from the coconut. I used 1/2 cup of unsweetened desiccated coconut in the batter so that it wouldn’t add any sweetness, just flavor and texture. I added 1 tsp vanilla extract and 1/2 tsp coconut extract. The vanilla did not mask the coconut. The coconut flavor is strong. There’s a lot of batter for an 8 1/2 x 4-inch pan, and I was concerned that it would overflow, but it didn’t. I generously greased and floured the pan, but didn’t line it, and had no problem with the loaf sticking to the pan. It fell right out. I brushed coconut milk on the warm loaf before turning it out of the pan, but didn’t sprinkle it with coconut. Instead I frosted the cooled cake with a white coconut flavored glaze, and sprinkled a layer of toasted shredded coconut on top of the glaze. Definitely a keeper! Thanks for your reply which I found very interesting but also slightly confusing with regards your comments about the history of the pound cake. I can’t see where you’ve actually stated the tin size though. Ive been a baker myself for over 33 years and I’ve converted your coconut cake recipe using bakers maths to ingredient percentages and recalculated and converted it to grams so that by the time the cake is baked it will actually weigh a pound providing that it’s baked in a pound tin. Total weight of ingredients 480g. During baking and cooling the cake will loose approx 5% of its total weight meaning that the final cold weight will be approx 450 – 460g which is equivalent to a pound in weight hence why it’s actually called a pound cake. I’m still looking forward to giving this a go as my recipe for a coconut cake isn’t great and it sounds as though from reading your comments that this could be a major improvement on my recipe. I’m gonna give this a go but I’m slightly confused as to why it’s called a 1lb cake. When adding up all the ingredients the total comes to much more than a pound. Maybe this is why many people have said that there is to much mixture for a 1lb tin. I think the ingredient total weights need recalculating so that they do actually total 1lb. 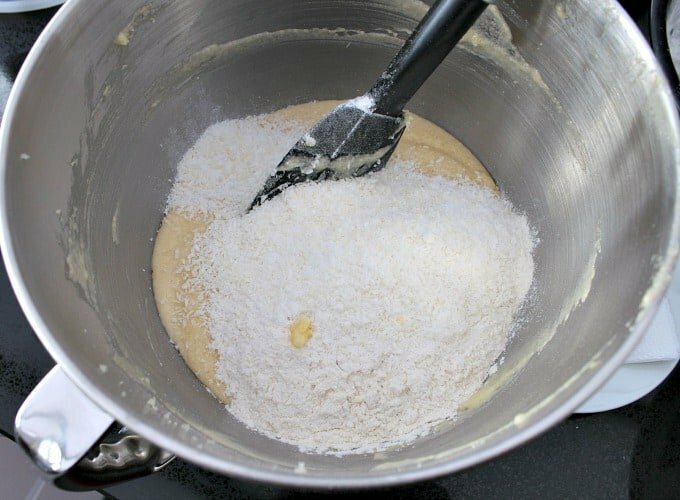 Hi Leslie, traditionally, pound cakes were baked in a 1 pound loaf tin, however, the name ‘pound cake’ also refers to its characteristic texture and density which you get from the ratio of ingredients, which give you a heavier and denser cake then say a light sponge which doesn’t use butter. These days, pound cakes are made in all kinds of baking pans, for example patterned bundt pans, muffin tins and so on. This recipe will fit in a 9 inch loaf pan which is the most common loaf size people tend to have at home. I’ve given the size of pan in the recipe so there shouldn’t be any confusion. Hi Rodi, yes of course, these are also lovely as cupcakes! A delicious coconut cake, very moist. I reduced the amount of sugar to 220 g. Also I only had to bake it for 50 minutes. I shared it with my co-workers who thought it was so good they were actually picking up the crumbs. They made me promise to bake them another one. I can’t wait to try out your other recipes. So much for the diet I was planning on starting. Hi – delicious cake, I made the coconut version. Could you tell me whether the temperature of 160 was for a fan oven because I assumed not and it took much longer to cook? Hi Viv, thanks for writing in. The 160c is for a fan oven. The timings can vary a lot between different ovens but it sounds like you worked out yours needed a little longer than my oven!! Hi Bev, glad you like the cakes. Yes, I would suggest you bake for a little longer, check after another 7-10 minutes at the same temperature and that should get did if the denser middle part. Much, so just try for a few minutes longer and that should do the trick! Thankyou for getting back to me I will give it a try both cakes got eaten tho ! Superb cake. Made it with wholemeal flour, light coconut milk and coconut sugar. The moistest cake I’ve made for a while. Holy guacamole this is the sweetest cake I have ever eaten in my 31 years on this Earth. If I ever ran the gauntlet and attempted to make this creation again I would use half (or even less) of the sugar suggested. Luckily I didn’t give any to my kids or they would be climbing the walls by now. TRIED FOR THE FIRST TIME THIS WEEK AND IT CAME OUT JUST AS DESCRIBED. PERFECT TEXTURE, MOIST, FLAVOURSOME AND FLUFFY. 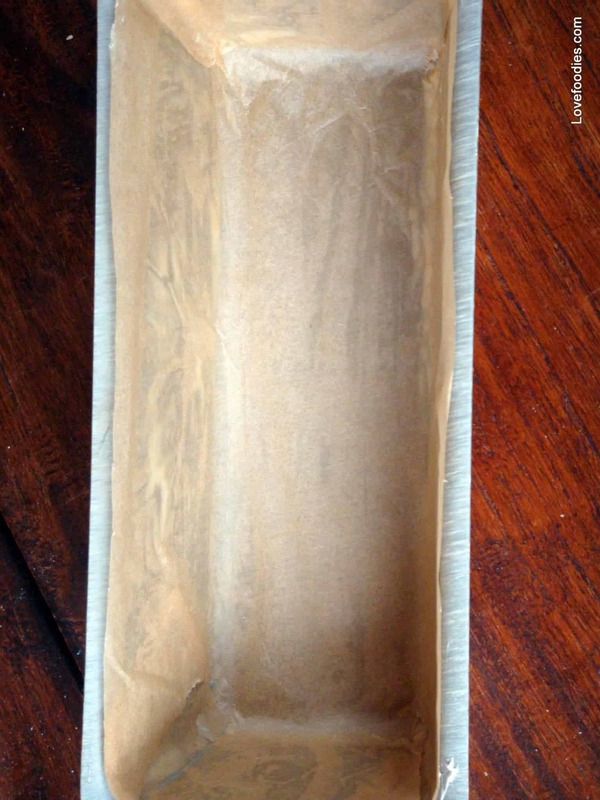 BAKED IN A RECTANGLE BUTTERED & FLOURED PYREX DISH. COOKING TIME APROX. 40 MINS. FINISHED THE CAKE AS SUGGESTED. IT’S ALREADY ONE OF MY FAVOURITE BAKES. THANKS VERY MUCH FOR THIS WONDERFUL RECIPE. Also I used a larger loaf pan . Came across this on line and so glad I did…. amazing, like truly amazing. I did change some things but it was done by accident and I loved it. I instead of the 4 tlbs if coconut milk for the topping I added almost of the rest of can that was left from the cake which I think was 3 or 4 ttimes the amount also I used a skewer and poked the whole way down making sure my holes were big enough and I used raw flaked coconut from Red mills and I also used more coconut on top… it was amazing very moist and dense…. so if you like a moiste cake try this . 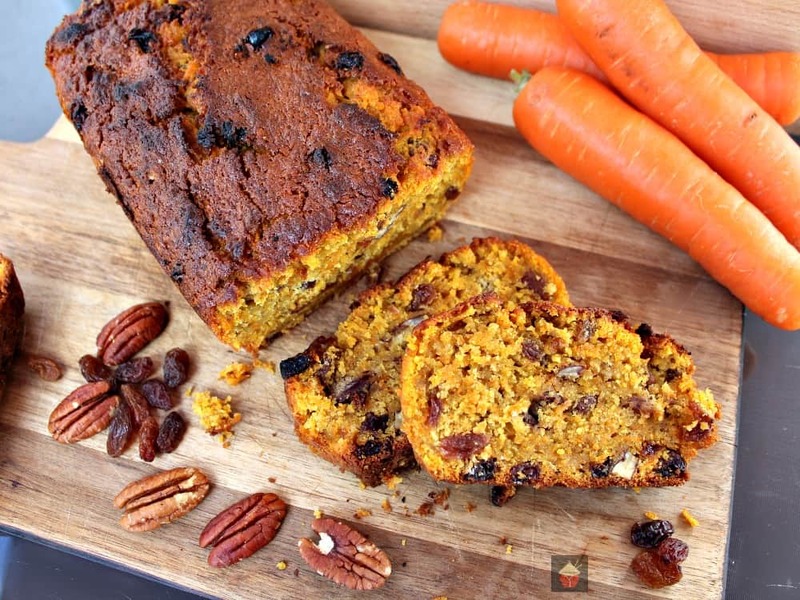 Thank you for sharing a recipe I’ll make forever… FYI, my hubby wants this at least once a month. My friend was begging me to make her a Coconut cake. Used this recipe, it was the best cake i’ve ever made. Used this loads of times since, as cupcakes (which are very popular) and also decorated cakes for Easter. I threw some toasted coconut into a blender to make a fine-ish dust. I’m not a fan of coconut texture in any way, shape or form, haha. I added powdered sugar to my coconut milk for the glaze. I am NOT disapppointed. Great tasting cake, thank you. I haven’t tried the cake yet but i would like to know if same measurements would fit an 8 inch round pan. Hi there, it is better suited to a 9 inch pan, because you don’t want to fill it more than 2/3rds full with the batter so I suggest if you plan on using an 8inch pan, have some cup cake cases or similar on standby so you can pop the extra batter in those. For cup cakes it will take around 19 minutes or so, so keep an eye on the time! For an 8 inch round pan, I am guessing the bake time will be around 45 minutes, (for a deep pan) so again, just keep an eye on the bake from 40 minutes onwards. Yes, you will need to split the mixture between 2 tins though. I did this last week. Put them in gas 3, bottom to middle and baked for an hour. Lovely. I just love your coconut pound cake. Could not stop.eating.it I will be making again and again.thankyou. Just made myself one of these, and am very pleased how well it came out. Had to make a couple of substitutions, used coconut cream instead of the milk, and used raw instead of normal sugar. To add another dimension to it, I added about a cup of frozen blueberries, just prior to pouring it into the tin. My oven isn’t the best, so it was about 1h 20m cooking time. Now I have to stop myself going and getting another piece, it tastes so good . . .
Amazing cake, very delicious. Highly recommended the recipe. I thought this recipe as written would be far too sweet so i made it with 220g sugar and it was plenty sweet enough. 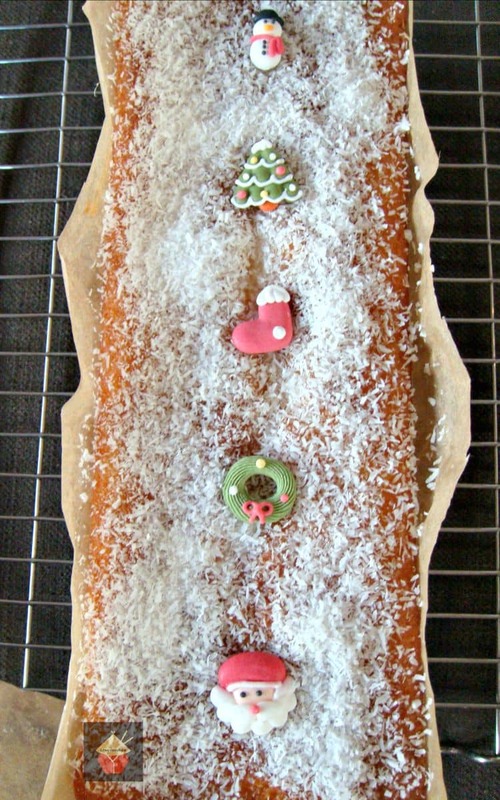 I then tried it as a traybake in a brownie tin, and topped with butter icing and sprinkled with dessicated coconut. Delicious! Marelyn says “what delicious cake. I made it as shown and the second time added a bit more coconut. Didn’t use the glaze as it was sweet enough. Quite yummy. I’ve never written a comment before on a food blog but THIS CAKE DESERVES ONE!!!! It was AMAZING!!! Today is my second time making it and it’s to share with friends, BECAUSE I ATE MY FIRST LOAF IN ONE SITTING! Hahaha! It was THAT good! I made the mistake of throwing away the remainder of the coconut milk because I completely spaced and forgot I need that for the topping. I hope it still tastes as amazing with just powdered sugar on top! Thanks for the recipe!! If I made this into a 12 in round cake what is the best way to bake it? Made the cake but divided into sandwich tins and in the centre i put a coconut butter cream filling. With loft over mixture I also made mini versions from cupcake! Absolutely gorgeous! Do you know if I can substitute coconut flour for some of the all-purpose flour to up the coconut flavor? Thank you for sharing such an amazing recipe. It’s the coconut cake of my dreams!!! I don’t have coconut milk. Can I sub regular milk and coconut extract? Do you think I could add a little crushed pineapple to this? Or would. That be too much liquid? This one has a cream frosting but you can leave that off of you prefer! Yes! Exactly what I was looking for!! Boo yah! This recipe is a keeper for sure, I’ve made it at least a dozen times and it’s always delicious, moist….the only problem that i run into each time is that it disappears so quickly. Some of the time I’ve omitted the glaze, other times I’ve added more coconut – that’s about as daring as it gets for me, lol. I love that you included the ingredient weights, weighing them is my preference for sure. I love coconut, this recipe is very good. My cake was really delicious , finished in 2 days. Easy recipe for anyone. Only suggestion is sugar amount ,because I found it too sweet. Thanks so much. This recipe came out lovely.. moist with the perfect amount of sweetness. Yes these freeze really well. I always cut mine in half and freeze half, only to stop it being eaten so quick! This is a good coconut cake recipe but it’s not pound cake as the ingredients would be different amounts. The cake is soft and fluffy not a dense pound cake. That said, it is very moist and good coconut flavor. I also tried it in cupcakes. I baked at 350 for approx. 15 minutes as instructed. I followed the recipe as stated and the cake turned out great. Only thing I did different was to grease and flour the pan instead of lining it and the cake came out easily. This recipe is a “keeper”! I only used one cup of sugar and for the butter I put only half the quantity and added plain greek yogurt. It’s in the oven now so I’ll tell you later how it turned out! me again, the recipe was a total success with the greek yoghurt and less sugar. Definitely a keeper. Thanks again! Anyone ever replaced butter with oil? Do you use sweetened or unsweetened shredded coconut? I made the moist coconut cake and it’s was absolutely delicious. I ended up making it 3 times in 3 weeks.It’s a huge success with everyone.Thank you so much for sharing a wonderful recipe. Is there no vanillas Essence required for this cake? This comment isn’t mine! The comment made on Oct. 29th IS my comment. I don’t know who this “Lisa” is or why she has my email. My name is Lisa too. I couldn’t be having the same email ID as u. I am just a regular reader and would like to make this cake. All I want to know – is there no need for vanilla essence in this recipe? That’s all. Hi Lisa, there’s no need for vanilla. If you add it, it will overpower the coconut flavour. Hi Lisa, so glad you’re enjoying the recipes! Please do browse through all our pound cake recipes (I have LOTS!). I only added 150g sugar and added 45g of coconut instead of the 4 tablespoons and it was sweet enough for me and others said it was sweet enough also. I would definitely make this again. Made this cake today but had to increase my oven temp to 350 degrees F for another 10 minutes to bake completely. Maybe my oven isn’t as hot as yours? Very yummy with rave reviews from my hubby and kids. Definitely a repeat cake! Would it be okay if I leave the shredded coconut out of the cake? I like coconut flavor but not the texture of dried/shredded coconut. Hi Del, so glad you enjoyed the cake!! Just made it and it tastes great! Made it in a bundt pan and greased it as well as I could, but still didn’t come out perfect. Maybe next time I’ll do the loaf pan, because it is definitely a ‘repeat’. Hi Denise, so happy you enjoyed the cake. To be honest, I’ve never baked this in a bundt, so I appreciate your tips! This recipe is great. I’ve added ground almonds just cos I love almonds! Tastes amazing with vanilla ice cream lol. Thank you kindly. Hi Liz! Thanks so much for your feedback and so happy you enjoyed the cake. I use ground almonds in quite a few recipes (I love them too! ), so if you’re looking for a few more recipes, I can recommend any of these ones if you have time to take a look. 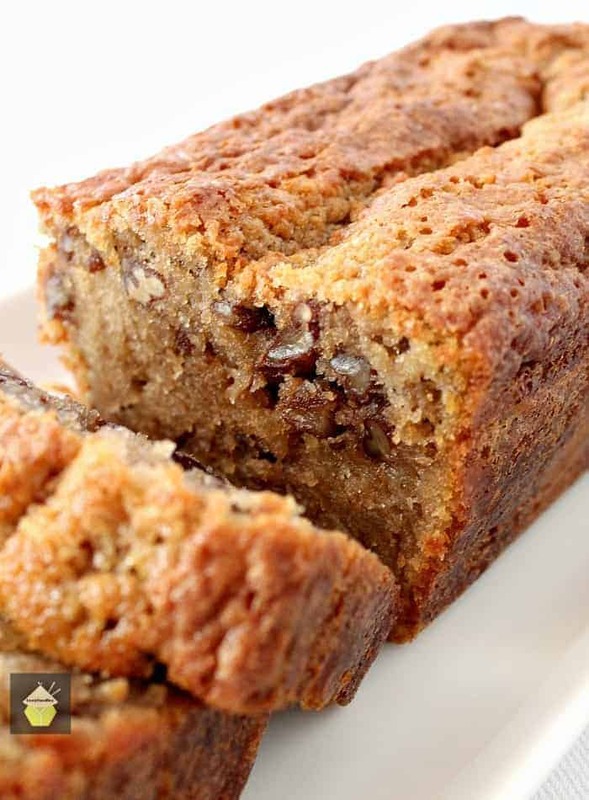 Lemon Frangipane – https://lovefoodies.com/lemon-frangipane.html , Pecan Almond Loaf – https://lovefoodies.com/moist-pecan-almond-loaf-cake.html Chocolate Almond Pound Cake – https://lovefoodies.com/chocolate-almond-pound-cake.html Hopefully you will get to try some! Hi Liz, it doesn’t matter if it is sweetened or unsweetened. Whichever you prefer. 🙂 Glad you like the recipe! 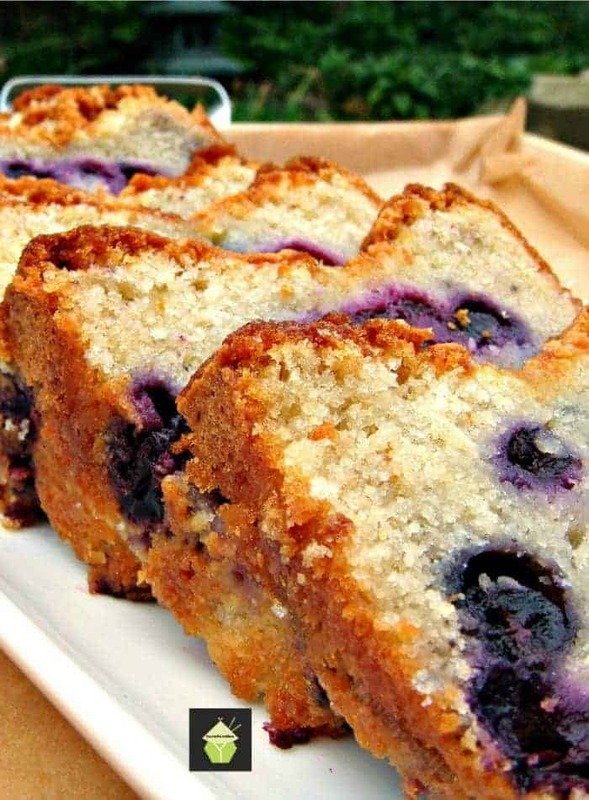 Hi Bharti, I have never tried any other ingredient because a classic pound cake uses eggs. Sorry I can’t be much help! Try using condensed milk instead of eggs and omit the sugar or add little bit if needed to make it sweeter. Made this coconut pound cake and everyone at home absolutely loved it!!! Including my very picky hubby. Great stuff there!!! Yay! Glad you all enjoyed the cake! Hi Rajula, yes indeed! I would suggest the oven temperature to go to 190 C and bake for approximately 15-19 minutes. Hope that helps! 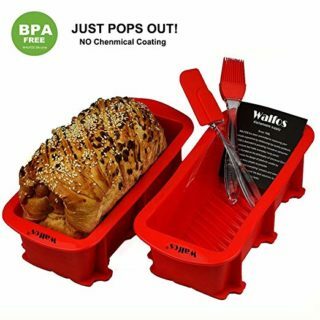 Where can I buy the Loaf pan.